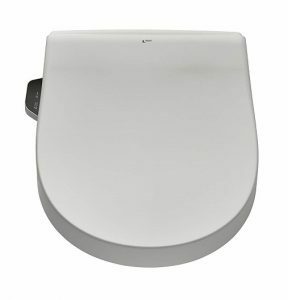 Today we’re going to take a look at another Inax bidet seat. This one is called the Inax 8012A. If you’re not already familiar with the Inax brand, this is a Japanese brand of toilet products and bidet seats. They are quite well-known in Japan despite low familiarity among markets outside Japan, especially North America. In terms of quality, we consider them on par with other Japanese brands such as Toto. In fact it’s hard to go wrong with either brand – it usually comes down to which bidet model suits the user. On that note, we’re going to take a look at the Inax 8012A bidet seat so you can determine if this is the bidet you want to get! To start, we’re going to take a look at the design in terms of its appearance, dimensions, and built. Right off the bat, we can tell you that the Inax 8012A is similar in almost every way to the Inax 8013A, so if you read our review of the Inax 8013A you already have a good idea of what to expect with the 8012A. One major difference is that this model (8012A) comes with a remote control instead of an attached control panel. On the remote control, there are three large buttons for “Stop”, “Cleansing” (rear wash), and “Bidet” (feminine wash). Next there are adjustment buttons for the “Spray Strength”, “Nozzle Position”, “Seat Temperature” and “Water Temperature”. And finally there is a “Nozzle Cleaning” button, “Eco” power saving button, “Massage” button that activates the massage function, and a power “Off” button. The remote control also has a battery meter so you’ll know when you need to replace the batteries. The Inax 8012A is available in elongated design only. This could be a problem for you if you have a round toilet. You should be able to see what kind of toilet you have fairly easily – a round toilet has a circle shape and an elongated toilet has an oval shape. Precisely, elongated toilets are about 18.5 inches long from the mounting bolts at the back to the front, and round toilets are about 16.5 inches. 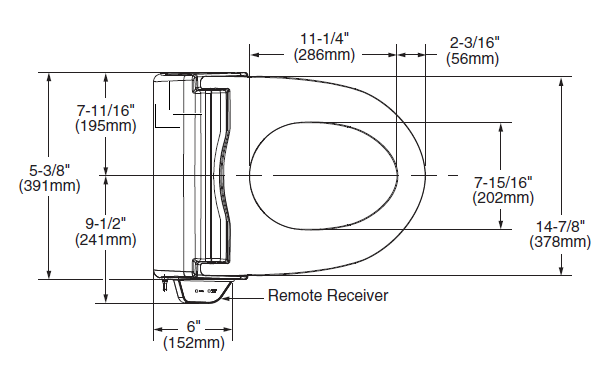 The Inax 8012A bidet will fit most elongated toilets. 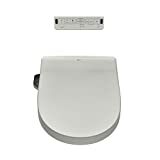 Its dimensions are 21-1/16″ (the back of the hinges to the front most part of the seat), 17-4/21″ (left most point to the right most point on the seat), and 6-22/25″ (rim of toilet fixture to the highest point on the seat). At less than 7” tall this bidet seat is quite slim! The Inax 8012A comes in Canvas White. It would be wrong to talk about a bidet seat without starting off with the cleansing function first! The Inax 8012A has a highly customizable spray. There are two nozzles for front and rear cleansing. And you can enjoy five different spray patterns: rear, rear oscillation, rear massage, front (feminine), and feminine oscillation. Oscillation means that the nozzle will move forward and backward so that you can clean a wider area. As we mentioned already, the spray of the Inax 8012A is customizable. Besides spray pattern, you can adjust the water temperature to 5 different levels and the water pressure to 6 different levels (the remote control allows 6 levels whereas the 8013A model with an attached control allows 5 levels). The minimum water temperature is 90°F/32°C and maximum water temperature is 104˚F/40˚C which, comparatively speaking, gives you a wide water temperature range. For most people, the ideal temperature is generally at 38˚C, give or take 2˚C. A neat feature of the Inax 8012A bidet is that it has a seat and lid that closes slowly and softly. You can detach the seat quickly with a single click when you want to clean the area around the bidet. There is also a deodorizer with the bidet seat that works by charcoal filter cartridge and helps keep your toilet smelling clean. A useful feature of this bidet is the Eco function. This function shuts off the water and seat heater for 8 hours (which is useful during the night when the toilet isn’t used). This is a particularly useful function for this bidet seat because it uses a tank heating system where water is kept warm in a reservoir. This kind of system requires energy to keep water warm, ready to be used at all times. The Eco mode allows you to save energy when the bidet is not in use. The reservoir holds 0.6 L of water which will give you approximately 35 seconds of wash time before water needs to be heated again. Why the Inax 8012A bidet? Buying a toilet seat bidet is a huge investment. After all, you’re going to be sitting on it multiple times a year for many, many years. You have to make sure that you get one that suits your needs (which is why you’re reading this, of course!). To help with your decision, we put together some reasons why the Inax 8012A might be the one you’re looking for. One major drawback with this bidet seat is that it doesn’t have an air dryer. Besides the wash and heated seat, most people want an air dryer with their bidet seat as a minimum. So if you’re looking for this feature, this bidet seat may not be for you. The other drawback is you’re out of luck if you don’t have an elongated toilet, as the Inax 8012A is only designed to fit elongated toilets. If you want a bidet that is similar in price and function to the Inax 8012A and has an air dryer, then we recommend getting the Toto C200. The Toto C200 is available in elongated or round versions, so it should work for most people too. The Toto C200 also has a couple of other neat features too that makes Toto stand out from some of its competitors. Check out our Toto C200 review to read all about it. This Inax bidet is compact and beautiful. It’s a well-designed product – as you would expect from a Japanese company. The cleansing function is its major selling point. Front wash, rear wash, massage, oscillation – whatever you need, it will deliver, and you can adjust it to your preferences. If you don’t need an air dryer with your bidet, and you want to have a bidet seat with a remote control instead of an attached control panel, then this is one of the best bidet seats in terms of cleansing function and quality that you can get.